The final day, and lover boy pulls out his big finale...Twelve drummers drumming. Are you kidding me? Dude, I take it you've thrown in the towel on this relationship, because the one thing you don't want to do is leave your beloved in a room full of musicians. I mean, I know they're drummers and all. It's not like you brought her a dozen guitarists-guitaring or lead singers-singing, but even the drummers get to lay claim to a little bit of that rock star charisma. Essentially what you've done is put the lady you're trying to gain favor with in a position where she's going to be hit on multiple times each day, and don't even get me started on what you've done to the poor dancers dancing or the maids-a-milking. All you've accomplished with this gift is make your life harder, as it's hard to resist a guy with a drum kit. How do you think I got Lori's attention? For a brief, shining moment, I thought this was a great gift. I mean, with all these people (and birds) that you've added to the house, it made complete sense to me that you'd need to improve your plumbing systems. At the very least you were going to need to install a few showers to accommodate the ladies dancing and the Lords leaping. Then my wife pointed out to me that they probably weren't those kind of pipers. Apparently they're bagpipe players, making this the worst gift in the history of gift giving. One bagpipe player should be enough of a reason for this guy to get dumped. Eleven of them, and I'm pretty sure the recipient would be immune from prosecution no matter what happened to their "true love". It's just occurred to me that as I write about these lavish gifts being given, that I might be setting Lori up for a little disappointment. Spending twelve days recapping another mans massive romantic gestures then having your wife unwrap a pair of gloves on Christmas morning might just be a bit of a letdown. Of course if she thinks I'm going to take my inspiration from the 10 Lords-a-Leaping, she's sadly mistaken. Why would anybody want ten dudes jumping around their house, even if they are Lords? This has to be confusing to the birds as heads keep popping up in the middle of their flight paths, and then there's the fact that it takes a really special man to be able to pull off style, poise, and grace while leaping around the place. OK, this guy has lost me now. I was a little confused as to what he was getting at when he made gifts out of 23 birds over the course of seven days, but now in the last 48 hours he's brought over 17 people. How is that romantic? I can kind of understand the maids...I mean, who doesn't want somebody else to take care of the housework for them. What's with the dancers though? I guess it might be interesting to watch them for a few minutes, but after that they're pretty much just going to be cluttering up the house. Also, what kind of dancers were they? If they're doing ballet, it should be fairly easy to forget about them. If they're tap dancers, you're going to have a massive headache, and it's really going to play havoc with your floors. I may have been wrong. For six of the last seven days, I've been complaining about how bizarre it must be to have your loved one continually showing up with gifts of birds, but there's not much higher on the weirdness scale that you can go than bringing over 8 maids-a-milking as a Christmas gift. How do you react when your true love (Although let's be honest...she's got to be questioning this relationship by now.) comes through the door followed by eight women (I assume they left the cows outside) and says "Ta-da! Here's your present!" It's creepy on so many levels. Also, how did milking end up being the maids job? Lori's parents were dairy farmers, and I don't recall ever seeing a maid doing the milking on their farm. Unless there's some pictures they're not sharing with us. This is it! The end of the birds. With today's seven swans-a-swimming our romantic hero has now dropped 23 birds on his true loves doorstep, three more than necessary to declare her house an official bird sanctuary. I wonder if he's including any bird seed with all these gifts? It's really not much of a gift if you have to spend $100 a month buying food for all these animals. Not that I'd know what to feed them anyways. I wonder what swans eat? I don't know about real swans, but apparently towel swans eat chocolate. And.....he's back to birds. Bigger birds this time. No more of the cute little things that can rest on a branch of a pear tree. Now he's up to full size birds who, from my childhood recollection, get a little testy if you don't share your food with them fast enough. 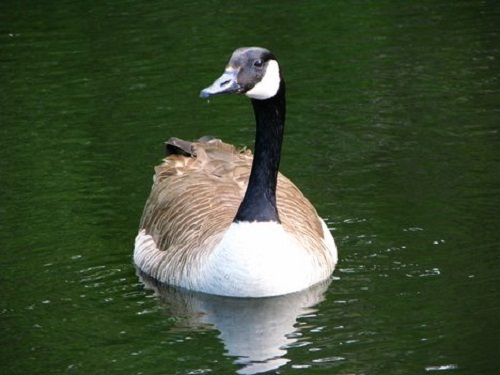 Also, why are these geese-a-laying? That's gotta make a heck of a mess in the house with eggs lying all over the place. I guess this is the kind of stuff you can get away with when you show up on the fifth day with five golden rings. I think we all know what happened here. Tired of her house being overrun by birds, the recipient of all these gifts finally took her suitor aside and told him "Look, if you want to still be around here by day twelve, I want to see something under the tree that doesn't want to make a nest in it!" Romeo responds by picking up five golden rings. Dude....overkill much? I once bought Lori two silver rings on a chain and I was golden for three months. Granted the rings were from Tiffany's and I hadn't just dumped a dozen birds on her, but I still think five rings is a little excessive. OK, I'm going to ask the obvious question here. What's this guys fascination with birds? For the fourth day in a row, he comes trotting over to his true loves house with some form of winged creature, this time deciding that blackbirds would make an ideal Christmas present. If there was any doubt about the depth of his girlfriends love for him it can certainly be put to rest by now. Lori would have kicked me to the curb a long time ago in this gift giving fiasco. Colly Bird? Beats me. It's black. That's close enough for me. It's not really a great day to be writing this. I write a lot of my posts with a not very serious tone, and I focus on the laughter, but I don't feel much like laughing today. 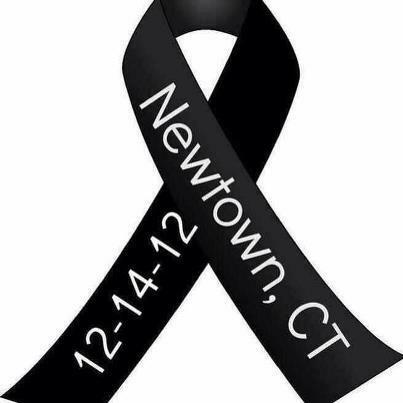 The events of yesterday in Connecticut leave me broken-hearted and hurting for the people affected, and really all I want to do today is curl up in a ball and feel sad. It's not very fun or frivolous, but it's kind of the way I feel right now. Has anybody ever bought you a partridge in a pear tree? Me neither, although I have to admit that I'm not that disappointed. I'm not a real bird person, and I wouldn't even begin to know how to take care of a partridge. Plus there's the whole pear tree thing to deal with. Does the partridge have to stay in the tree? Do I keep the pear tree inside or outside? Does the partridge eat the pears (that would be handy), or do I have to feed him something else? Truthfully, as a first day of Christmas gift, I don't think I'd be that impressed. Those probably aren't partridges are they? It's life. You don't always get to choose the circumstances in which you live, and despite all my enthusiasm for traveling, there are some things that are more important. Occasionally those things will raise their heads, and travel has to become a secondary consideration. It's happened to us this Christmas, and unfortunately, we're finding ourselves needing to be closer to home than a trip to Anaheim allows. We've put it off as long as possible, hoping for a different solution, but now it's time to cancel our trip. WHO ARE THEY? - Mary claims to be an island girl, now married and living with her two kids in San Diego. I guess she gets credit for being an island girl since she was born in the Philippines, but in my mind you're not truly an island girl until I've seen a picture of you in a coconut bra and a grass skirt. As closely as I've read her site, I can't recall ever seeing Mary dressed up in an outfit like that. Her husband sure...but we're talking about Mary here. It's December 7th. That means that there's only 24 days left this year, which also means that there are 342 days of this year behind us. That's how much time I've had to work on my New Years resolutions for 2012. It's strange but when you have 342 days ahead of you, it seems like enough time to accomplish almost anything. When the 342 days are behind you though, it seems like you barely had time to scratch the surface of everything you intended to do. Don't let the clock manufacturers fool you...time definitely has two different speeds depending on which way you're looking. I'm a big fan of Christmas light displays. Not the actual assembling of them...I think I've made it clear that I have no talent at all when it comes to putting the Christmas lights up...but I love looking at the houses that go all out to drain their local power grid and ensure that nobody on their block sleeps before midnight. That's probably why the event "Light up the Vines" appealed to me. The concept, at least as I understood it, was that all the wineries along Bottleneck Drive in Summerland (about 20 minutes south of Kelowna), were going to string Christmas lights around their vineyards, and for two nights the public would be welcome to make the rounds among the wineries to see the displays and, of course, to visit the gift shops for some late night wine tasting and Christmas shopping. It sounded like a fun evening out. One of the reasons my wife gives for having to go shopping in every town we visit, is that she likes to collect Christmas ornaments from the various places we go. This is actually one of the (very few) shopping activities that I approve of (like I get a vote), as it's pretty cool to stand there and look at your Christmas tree and think back over all the great trips you've had through the years. This weekend, the tree went up in our house, and while I wasn't around to help set it up (Believe me, they plan it that way), I got a chance yesterday to take a look over all the different ornaments hanging on the tree. Ah yes...the Disneyland 50th Anniversary ornament. That was a good memory. What else do we have? We have something unique to the world here in Kelowna. Other than being the birth place for two of the three MKTS children, an event which the city still hasn't managed to find funds to commemorate, Kelowna is the home of Layer Cake Mountain. This mountain was formed from lava flows a long time ago, but what makes it unique is the even layers in which the lava hardened. Scientists used to think that it was the result of numerous separate lava flows over time, but now the popular theory is that it was just one big lava flow. As for why it hardened in equal layers...well that's a good God question. If you prefer though, and you understand a lot of big words, there's a sort of explanation here. WHO ARE THEY? - Living with her high school sweetheart husband and four boys, Jessica is like the action movie heroine, doing battle against the forces of...well...male-dom. I can't imagine what it's like to try and be the voice of reason and sanity in a house full of testosterone, but not only does Jessica keep things together, she does it with all the grace and charm of a true southern lady. I haven't had the pleasure of meeting her in real life yet, but somehow I get the feeling that when I do, I'll feel the need to address her as Ma'am. One of my favorite parts of spending Christmas at Disneyland is the decorations. For a place that gets absolutely no snow, it's amazing just how festive of an atmosphere Disney can create simply by stringing lights and tinsel all over the park. It doesn't matter that I'm in shorts and a t-shirt instead of snow pants and a parka, when I walk down Main Street, my mind says "Christmas", and I could spend hours just looking at the incredible job the Disney imagineers do in transforming the park every December. My love of Christmas decorations however, does not extend to my own house. My most hated job every year is the putting up and taking down of Christmas decorations. It's ridiculously time consuming, and no matter how much planning and effort I put in, our display always ends up looking like an afterthought. This frustration probably isn't helped by the fact that I happen to live in a neighborhood that has a talent for this kind of thing. Every time I drive down my street, I'm reminded that decorating is not my forte, and that I live in the proverbial "Ditto" house. This year though, I thought I would try and take some inspiration from Disney. I figured that if I started early enough, and studied as many pictures as I could of the Disneyland decorations, that I must be able to find some level of Christmas spirit that I could apply to my own home. 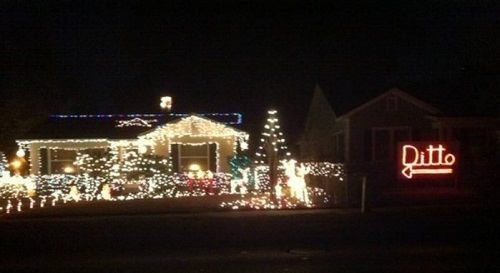 There has to be a minimal amount of festiveness that even the most un-handy of people can achieve. I mean, if a Mouse can decorate his place with enough flair to make millions of people smile, there must be something I can do to at least not embarrass my kids right? Right? Well, I do own a couple strands of icicle lights, but I think we all know that this one is way beyond my capabilities. It's too bad really, because our house is almost the exact same size and shape. I'm not in charge of the tree at our house, so this really doesn't fall under my jurisdiction. I have one ornament that I hang on the tree each year (a Miami Dolphins ball), and then after that I leave it up to Lori. I can tell you that we definitely won't be putting a giant drum out for the kids to bang on. Apparently some of the imagineers don't actually have kids. Goofy's house is getting a whole lot closer to my level, as by the end of the season my lights are usually all twisted and hanging off the roof as well. Still, I think I'm looking for something a little simpler than wreaths and poinsettia leaves in strings that wrap around a chimney. Let's keep looking. Hmmm...simply covering everything in candy cane colors seems like a super easy way to convey the Christmas spirit. Sadly though, I have neither the red and white wrapping paper, nor the giant 'L' to put out front of my house (Although it did mysteriously disappear from California Adventure just after this picture was taken). How cool would it be if I did though right? That'd put those neighbors in their place. Antlers! Of course! Even I can slap a pair of reindeer horns and a little red nose on once in a while. It's simple, it's easy, and it pretty much screams Christmas. I think we've found that level of Disney Christmas that I can aspire to. This post is a part of Wordless Wednesday over at Focused on the Magic. If you didn't get here from there, you should really head on over and check out some of the fantastic people that hang out there on Wednesdays. Some of them probably have more than a single string of lights on their house, maybe even in different colors! They'd feel right at home in my neighborhood. That's always the point that throws me. I've never known a single child who fell asleep on Christmas Eve with a vision of a sugar-plum in their head. In fact, I don't even know what a sugar-plum is. I like sugar, but I'm not a big fan of plums. How do you know if combining the two is a good idea? Googling doesn't seem to help, as a search for images of "sugar plum" brings results ranging from dusted up flowers to a picture of a naked man on a couch. ...I'm pausing for a minute while half my readers finish Googling "sugar plum". Last weekend though, I had the chance to figure out once and for all just what a sugar-plum is. One of our local wineries was hosting a "Sugar Plum Fair", and although I don't spend a lot of time at wineries, this became a must-do event in our day. 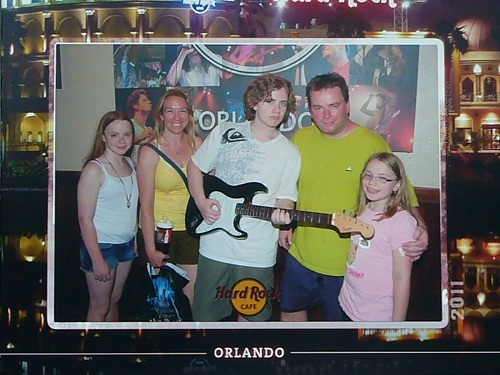 In fact, we decided that it should be a family outing, although we did give the kids an out. Anyone who could convince me that they already knew what a sugar-plum was, didn't have to come. It's one of the benefits of living in a town built around a lake. Everywhere you go in Kelowna, there are fantastic views. Even from places like an everyday bus stop. A few days ago I was complaining about needing a date with my wife. This weekend we got that chance, and after a quick dinner it was decided that our evening out was going to be spent at a Westside Warriors game. The Warriors are our local Junior A hockey team, one tier level (but two price levels) below the Kelowna Rockets, and with the NHL still in lockout, I saw it as an easy way to get in a little live sporting action without spending a whole lot of money. While I enjoy writing this blog for you guys, I kind of have this picture in my mind of one day writing a book. I don't know what the book would be about, as I really only know how to write about our family, and since I cover that here it seems a little redundant, but I think I'd like to see my name in print on a bookstore shelf one day. Of course, I'm not really in to that whole "starving writer" thing. I see myself being more of a Richard Castle type, living a life of fame and glamour, regretting the day I gave Oprah's people my number because now they won't quit calling. "I'm sorry I'm holding up the book club, but I'll finish the book when I get to it!" There's a bit of a hole in my travel world this week with the news that Hostess is shutting down and stopping production of Twinkies. Everywhere we've gone Twinkies have been one of our go-to snacks, filling our need for both golden spongy cake and delicious vanilla cream filling, but since I'm not willing to tap into our emergency stash that we keep hidden in the basement (gotta be ready for the zombie apocalypse you know) I'm now faced with the task of finding another snack that we can take on the road with us. Fortunately one of my friends, probably tired of hearing me whine about the loss of my favorite breakfast food, pointed out to me that there was a snack expo on at the Kelowna rec center this weekend, and suggested that I could probably find a replacement for my beloved Twinkies there. WHO ARE THEY? - Leigh is pretty much the exact opposite of me. She's a wife and a Mom (That's strike one and two), an amazing photographer (strike three), and an incredibly active outdoors enthusiast (strike 4 through 1000). Also, for somebody who actually owns a home, she's there less than anybody I know. I really need to install a GPS chip on her to keep track of where she is, except half the places she ends up probably don't have a GPS signal available. I love my wife. She's beautiful, smart, funny, and has an amazing amount of patience considering how much she has to put up with from the kids and I. Traveling with my wife is one of my absolute favorite things to do in life, but you know how they say nobody's perfect? It's possible...just possible mind you....that my wife may have a little bit of a shopping addiction. Now I know how addiction works, and I know what you're supposed to do, but every time I try and arrange an intervention, Lori ends up talking all her friends and loved ones into going to the mall with her. Obviously they don't understand the seriousness of this situation, but since I'm losing that battle, I decided that I may as well try and get some tips for you guys from someone who, by pretty much any definition of the word, is an expert shopper. Please note however that usage of these tips is entirely at your own risk. 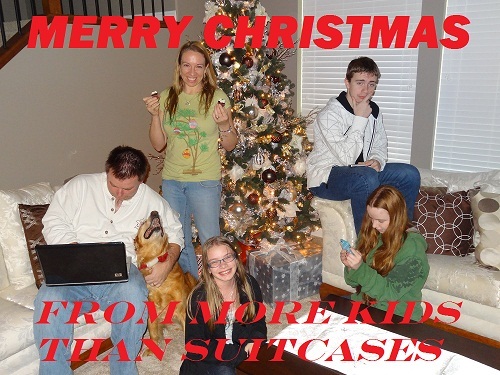 More Kids Than Suitcases accepts no responsibility for any overspending that may take place. I've told you about our tradition of spending Christmas Day at Disneyland but, while I wouldn't call it a tradition, there's something else that we do with reasonable regularity when we're in Southern California - Christmas Eve service at the Crystal Cathedral. While we're not fanatical about attending church when traveling, Christmas is one of those times we like to make sure we get a little spiritual prompting, and the Crystal Cathedral just happens to be convenient for us, being located a short walk from where we usually stay at the Hyatt Orange County. One of the very first magic shows I ever saw in Las Vegas was Siegfried and Roy. It was a few weeks before the tragic show where Roy was attacked by one of the tigers, and it was pure Vegas glitz and glamour. Lori and I sat in the front row, I got my arm slobbered on by one of the white tigers, and I remember leaving the show thinking that aside from a couple of mild sexual references, that was a show I would have enjoyed taking my kids to. Every Friday that I can, I write a post here to link up with Rebecca over at R We There Yet Mom for her Friday Daydreamin' segment. It's supposed to be about something we're longing for while we go about the hustle and bustle of our daily lives, but I quite often end up telling some bizarre story instead (and some are far more bizarre than others). This week though, I really am longing for something. It's not a tropical beach or a weekend in Vegas, although I wouldn't have an objection to either of those things. It's a little simpler than that. This school year, and all it's extra-curricular activities, has started out so busy that all I'm really thinking about is finding time for a dinner date with my baby. Our kids have a bit of a reputation at school. No, it's not as the kids who have the coolest parents (although I have no idea how that couldn't be). They're known as that family that's always going somewhere. Since preschool, our kids have spent most of their spring, summer, and winter breaks, and a good chunk of their long weekends, traveling. They've seen all sorts of things in all sorts of places, but in case you think it's been all travel and no fun, a large portion of that time, including all the Christmas seasons, has been spent at Disneyland. Part of the job of parenting is to be concerned about the things my kids are learning. Not the school part of things - their teachers do a fine job of that - but teaching things like patience, motivation, and inspiration, fall to Lori and I as the parents. For instance, when I make my younger daughter do her math homework, I'm hoping she's learning the value of time organization and thinking numerically. When I make my older daughter clean out her room, I'm hoping she's learning that it would be a lot easier if she just kept things neat as she went. When I tell my son to stand just a little further to the left for a picture...Well really I'm hoping the he's just learning not to be so gullible. By now you've heard all about More Kids Than Suitcases. International jetsetters...Highly respected experts on pretty much everything...World-renowned blog, considered a "must read" by all of the brilliant minds of our day. I'm sure that's all old news to you by now, but there might be something you didn't know about us. Something we don't talk about too much these days. Something that's entrenched in history, yet often overlooked while the world focuses on our current projects. Did you know we used to be a band? Are we timely around here or what? A mere one week before Halloween and the topic for this week's Wordless Wendesday is Disney costumes and attire, which has particular relevance in my case as I still don't have a costume picked out. It shouldn't really come as a surprise that I leave things to the last minute, as I really am terrible at making decisions. I see the massive array of possibilities in the Halloween stores and my brain just shuts down, so to help me limit my choices, I asked my family for some ideas as to what I should dress up as. I really shouldn't ask them so many questions. It's Wordless Wednesday again, and this week we're talking about Disney Storytelling. Disney pretty much is stories, so it shouldn't be too hard to find great stories wherever you are, but those are the published, well documented stories. We all know these stories. They start out "Once upon a Time..."
When it comes to recapping holiday travel for people, we always get asked the same two questions. "How was your Christmas? ", and "What did you do for New Years?". I much prefer answering the first question, as it usually involves a recap of how many trips through Space Mountain we managed to make, followed by a detailed description of what goodies the Hyatt put out on the buffet table that morning. Our family tradition of spending Christmas morning at Disneyland seems weird to some people, but to us the year just doesn't seem complete without it. I don't get to go everywhere. I usually write about our travels as a family, but sometimes the other members get to go places without me. My son went on a sleepover at the Vancouver aquarium without me. The kids have all been to the Capilano Suspension Bridge without me, and a couple of Octobers ago, my wife got the chance to accompany her friend to a Champions Series tennis event in Surprise, Arizona. So back in February, I wrote a post called Strange Searches that Got You Here about some of the rather bizarre terms that people were searching for that were bringing them to the More Kids site. What I didn't realize at the time, was that by putting these strange search terms into a post, in Google's eyes I actually became more of an expert for anybody else searching for the same term. Hence, over the last eight months, the number of people arriving at my site from the search term "Guys who marry out of their league" has gone up tenfold. Seriously...I know she settled, but it's kind of depressing. Disneyland is pretty impressive to look at. I mean there's the detailed buildings, the high rising mountains, and that whole Sleeping Beauty Castle that sits right in the middle of everything. I can't even begin to imagine how many imagineers it must have taken to dream up all of this stuff, and then the ridiculous amount of architects who would have been needed to design it. Getting every detail just right must have taken years and years of hard work. It's not like they make it out to be in Vegas Vacation. When cousin Eddie steps up to the buffet and orders "a little of the yellow" since the food is only distinguishable by it's color, everybody thinks back to the worst buffet experience they've ever had and groans. I've been to some of those buffets, but I'm happy to say I've never encountered one in Las Vegas itself. In fact, with only a couple of mild exceptions, almost all of my buffet experiences in Las Vegas have been excellent. So when it comes time to feed my kids in Vegas, I have no hesitation taking them to the nearest buffet. So today is Canadian Thanksgiving. I know it's true because we get the day off work, but truthfully it just doesn't feel like Thanksgiving up here. It's probably because the bulk of our media comes from south of the border, and American Thanksgiving isn't for another month yet, but I haven't seen a single person in a pilgrim costume, the TV isn't airing "A Charlie Brown Thanksgiving", and the only parade I've seen was a bunch of drunks trying to make their way home from the bar last night in single file. Still, I've got a calendar sitting in front of me that says today is Thanksgiving, and that I should be spending my time giving thanks.